Uptown Grill Blog: Steelhead: Trout or Salmon? A few years ago, we had prepared steelhead and offered it on our menu as salmon. We had a customer who knew quite a bit about fish species, and he informed me that steelhead was actually considered to be a trout. It was a lesson learned. Still today, this is one of the more common questions that we not only get from our staff, but that we might get from customers as well. "Steelhead is salmon, right?" Well, to answer that question, I turned to the National Wildlife Federation for our final answer. At the end of the day, you could say trout or salmon and technically still be correct. Hmmm? As it would be, rainbow trout/steelhead are both ray-finned fishes in the salmon family, and both are the same species. Part of the confusion may stem from the fact that rainbow trout/steelhead looks, tastes and has the same texture as salmon. The real difference lies in their lifestyles. Steelhead are considered to be Anadromous. Yes, I said the same thing, "Anadromous?" This means that they spend part of their lives in the sea, whereas rainbow trout spend all of their lives living in fresh water. Their different lifestyles result in different skin colorings, thus making them easy to tell apart. To further explain the difference between steelhead and salmon, we can look at how they spawn. When some types of salmon spawn, they return to their birthplace to do so... as do steelhead. When steelhead spawn, they make the journey from the sea back to their original birthplace, fresh water. Unlike salmon, steelhead do not die after spawning, and they can go on to spawn several times. So whether ordering steelhead trout or steelhead salmon, we'll understand what you mean... and we'll promise not to correct you! But, you must stop in soon as our steelhead will move fast. 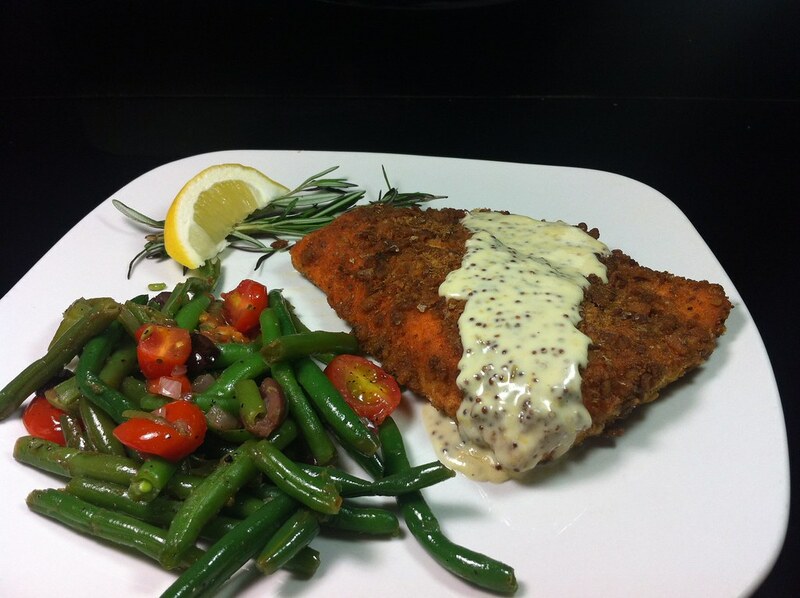 We lightly bread and sautee our steelhead in pretzel crust and top it with a stone ground mustard sauce you will enjoy!